CHARLOTTE, North Carolina (WPVI) -- Employees at a Charlotte, North Carolina Waffle House got an unexpected surprise late Wednesday night. 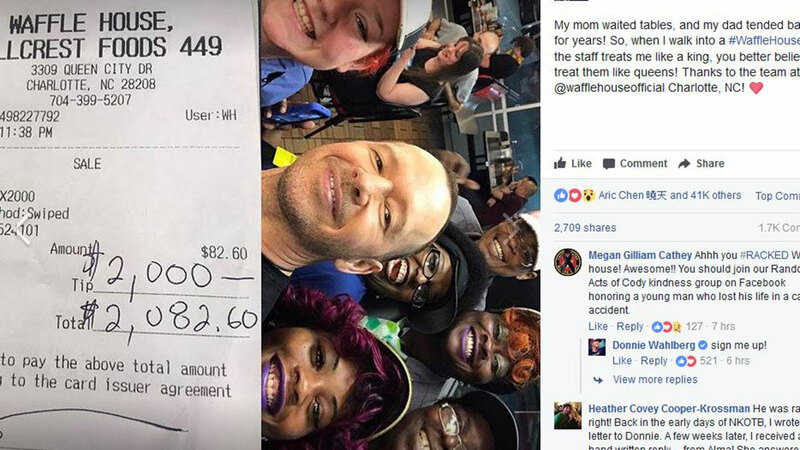 Actor and New Kids on the Block singer Donnie Wahlberg posted a photo on his Facebook page of his check at Waffle House for $82.60, with a $2,000 tip! "My mom waited tables and my dad tended bars -- for years! So, when I walk into a #WaffleHouse, and the staff treats me like a king, you better believe I treat them like queens!" Walhberg wrote in the post. Wahlberg also posted a Facebook Live with the employees. In the video, the singer handed out tickets to his New Kids on the Block Charlotte show for Thursday night.